This is the tombstone of James Henry Brewster. The tombstone is located in the Brewster plot of Mt. Hope Cemetery, Independence, Montgomery County, Kansas. 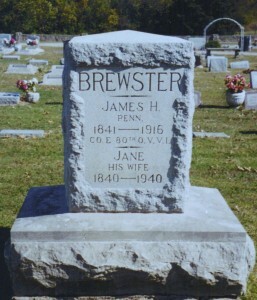 The tombstone is inscribed BREWSTER, James H., Penn. 1841-1916, Co. E 80th O.V.V.I.– Jane, his wife 1840-1940. James Henry Brewster was born 9 August 1841 in Pennsylvania. He was the son of Jackson and Mary Ann (Martin) Brewster and was the older brother of my great-great-grandfather, Daniel Brewster. James Henry Brewster married Jane Newton 8 March 1866 in Tuscarawas County, Ohio. Jane Newton was born in 1840 in Ohio and died in 1940 in Montgomery County, Kansas. James Henry and Jane Brewster had eleven children: Henderson Angelo (1867-c1946), Franklin Delano (1868-1933), Caroline “Callie” (1870-1947), Margaret “Maggie” (1871-1942), Jesse B. (1873-1944), Flora Belle (1875-1965), Niles Orland (1876-1902), Millie Nell (1878-bef 1970), Daisy (1880-bef 1900), Emerson Walter (1883-bef 1970), and Jennie (1884-1969). James Henry Brewster was enumerated with his family in Goshen Township, Tuscarawas County, Ohio, in the 1880 US census. His occupation was stone mason. The family moved to Kansas a few years later. The above photo shows the current Montgomery County, Kansas, Courthouse in Independence. 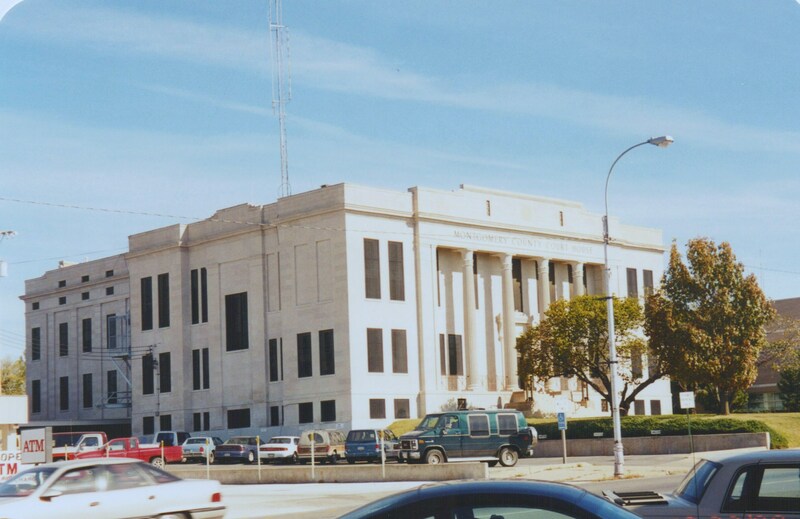 James Henry Brewster built a courthouse for Montgomery County in 1886 at a cost of $34,900. Several of his sons continued the construction business as the Brewster Bros. Franklin D. Brewster was the contractor for a new city hall in 1915. The Brewster Bros. built other buildings that included a Junior High School in 1922, a large ice storage building in 1924, and various remodeling jobs of city buildings and churches. Thanks to my fourth cousins, Jean M. & Deb B., for sharing these photos and information about James Henry Brewster and his family with me several years ago. They are direct descendants of James Henry Brewster and descend from his daughter Caroline “Callie”. Thank you for the welcome! You are a great group and I have gotten several ideas from the Daily Themes. My granny lives in the farmhouse you described in the article, there’s a concrete slab at the front with his name and the dates 1884-1911. My sister and i wanted to know more about the house so we looked up the name and found your article! It’s a beautiful house, and the master craftsmanship is quite evident in how well preserved the house is. Thanks for writing. This is so interesting! It is good to know that the house is still in very good condition. I hope to get out there and see it someday. Trinity, My name is Debbie Bass, J.H. Brewster was my Great Great Grandfather. My mother has pictures of the house that you Grandmother lives in. She also has a piece of Furniture from that house. One of the pictures is as it is being built. She is hunting the pictures. She will get hold of you. Could you send a resent picture of the house along with a picture of the cement slab that has the dates on it? We will get pictures of the house and get them to you. J H Brewster and Jane are my great grandparents. Frank D Brewster is my grandfather. There are still a number of descendants in this area (Independence). I was looking at this site because in an hour or so some folks from New Mexico are coming by to visit , they are from the Minnie Wilson line. Never met before but I am looking forward to exchange of information. Years ago Ken Brown did a series of books on homes and buildings in this area ( always complementary of the Brewsters) Thanks to Claudia and her husband Richard for keeping the old house alive. Understand someone has contacted Claudia about doing an article on the old house. Hello Cousin! I am glad to hear from you. I would love to know about the old house and see some recent photos of it. Any information about the family and the home is always appreciated. Thanks! I’m sorry I mistakenly referred to Robert Soleman and family as being in Minnie’s line when in truth it is Caroline’s (Callies) line through her daughter Lena. The Soleman’s were in the area to lay to rest Robert’s brother Loyd at Bartlesville, OK. Among the family members here were Loyd’s daughter and son, Mary and Pat.